Published Dec 2000 by America's Best Comics. Volume 1 - 1st printing. 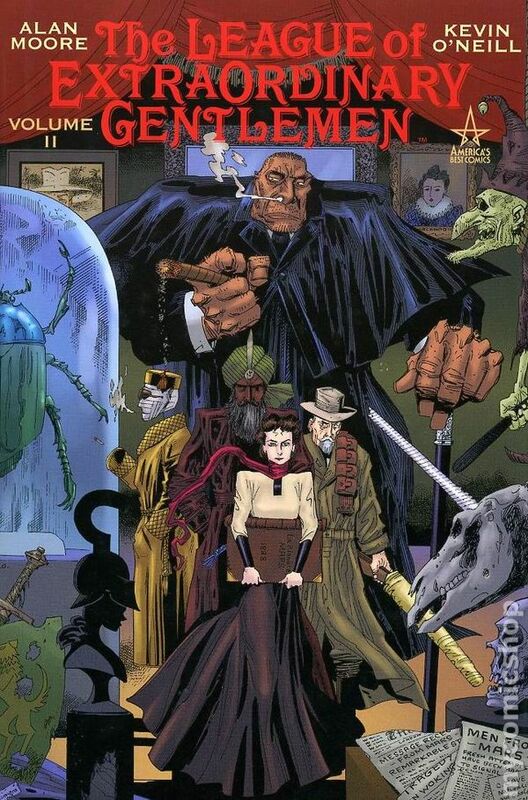 Collects League of Extraordinary Gentlemen (1999 1st Series) #1-6. Written by Alan Moore. Art and cover by Kevin O'Neill. Ladies and Gentlemen, the hour is at hand, the object of your desire has arrived! The award-winning series by Moore and O'Neill is available in a handsome softcover edition. Thrill to the immortal adventures of Mina Harker, Allan Quatermain, Captain Nemo, the Invisible Man, Dr. Jekyll, and last but not least...Mr. Hyde. This marvelous band of adventurers is recruited by the Empire in her hour of need, to discover the secret of White Chapel...and the nefarious plans the sinister Doctor has for it. Hardcover, 194 pages, full color. Mature Readers Cover price $24.95. Published Sep 2000 by America's Best Comics. Volume 1 - 1st printing. 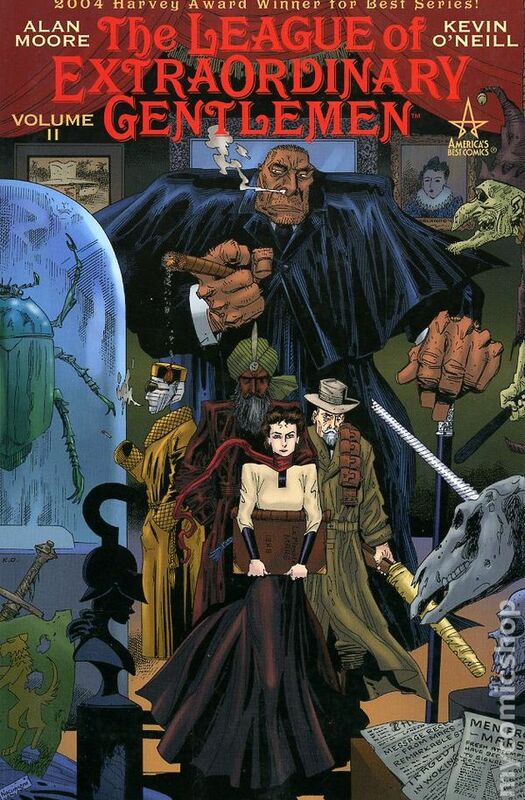 Collects League of Extraordinary Gentlemen (1999 1st Series) #1-6. Written by Alan Moore. Art and cover by Kevin O'Neill. Ladies and Gentlemen, the hour is at hand, the object of your desire has arrived! The award-winning series by Moore and O'Neill is available in a handsome softcover edition. Thrill to the immortal adventures of Mina Harker, Allan Quatermain, Captain Nemo, the Invisible Man, Dr. Jekyll, and last but not least...Mr. Hyde. This marvelous band of adventurers is recruited by the Empire in her hour of need, to discover the secret of White Chapel...and the nefarious plans the sinister Doctor has for it. Softcover, 192 pages, full color. Cover price $14.95. Published Nov 2011 by America's Best Comics. Volume 1 - 2nd and later printings. 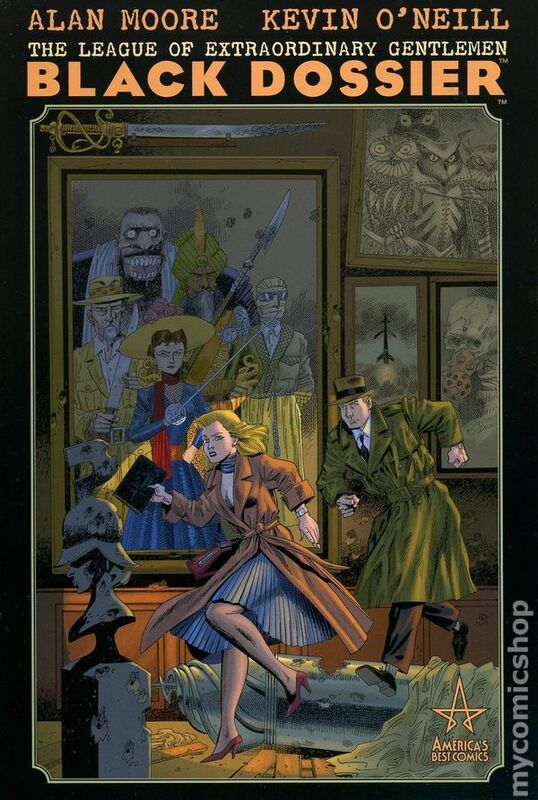 Collects League of Extraordinary Gentlemen (1999 1st Series) #1-6. Written by Alan Moore. Art and cover by Kevin O'Neill. Ladies and Gentlemen, the hour is at hand, the object of your desire has arrived! The award-winning series by Moore and O'Neill is available in a handsome softcover edition. Thrill to the immortal adventures of Mina Harker, Allan Quatermain, Captain Nemo, the Invisible Man, Dr. Jekyll, and last but not least...Mr. Hyde. This marvelous band of adventurers is recruited by the Empire in her hour of need, to discover the secret of White Chapel...and the nefarious plans the sinister Doctor has for it. Softcover, 192 pages, full color. Cover price $14.95. Published Nov 2003 by America's Best Comics. Volume 2 - 1st printing. 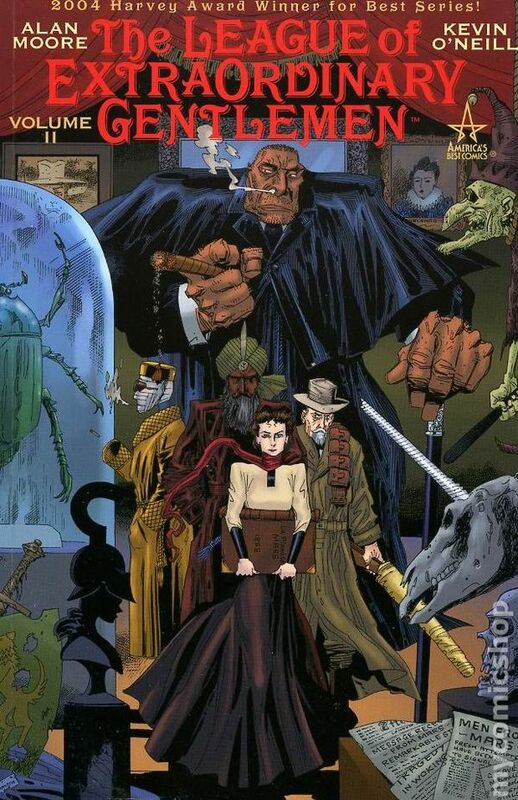 Collects League of Extraordinary Gentlemen (2002-2003 2nd Series) #1-6. Written by Alan Moore. Art and cover by Kevin O'Neill. 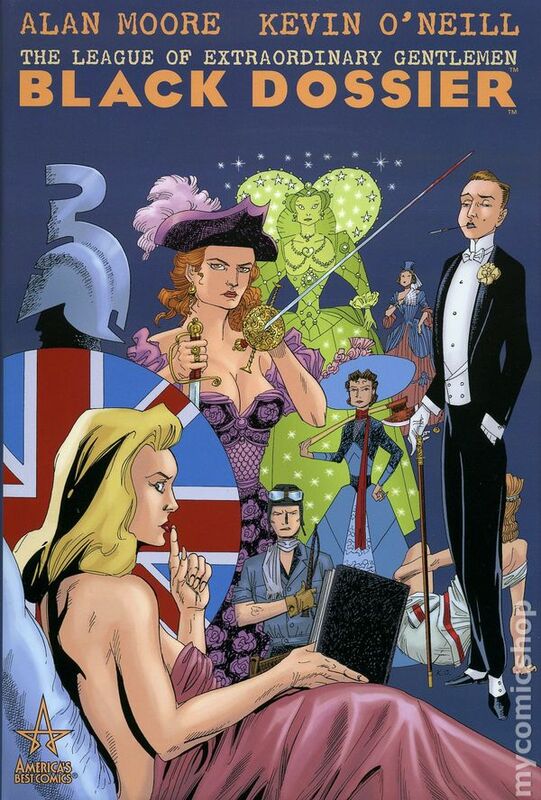 Alan Moore and Kevin O'Neill return with the further adventures of The League of Extraordinary Gentleman in this collection that reprints the best-selling second 6-issue miniseries. 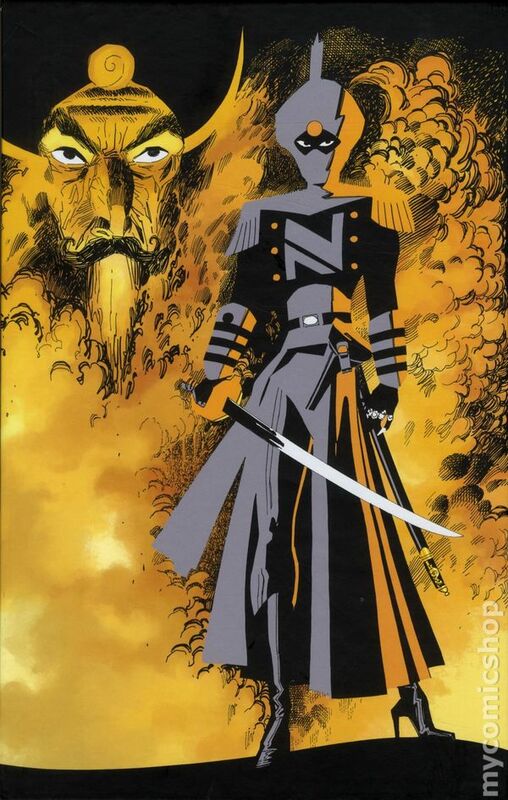 It's one month after the events in LEAGUE OF EXTRAORDINARY GENTLEMEN VOL. 1, and the skies over England are filled with flaming rockets as Mars launches the first salvo of an invasion. Only our stalwart adventurers - Allan Quatermain, Mina Harker, Captain Nemo, Hawley Griffin, and Mr. Edward Hyde - can save mother England and the very Earth itself. But there are many startling revelations along the way, including the blossoming of love and the uncovering of a traitor in their midst! Also included in this volome is an almanac of fantastic places that spans the entire globe as well as special supplemental material by Moore & O'Neill not found in the original periodicals! Hardcover, 230 pages, full color. Mature Readers Cover price $24.95. Published Aug 2004 by America's Best Comics. Volume 2 - 1st printing. 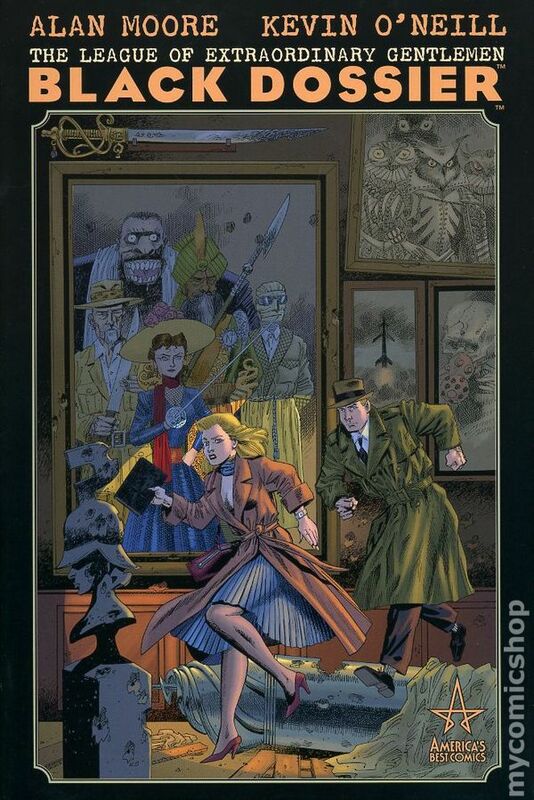 Collects League of Extraordinary Gentlemen (2002-2003 2nd Series) #1-6. Written by Alan Moore. Art and cover by Kevin O'Neill. 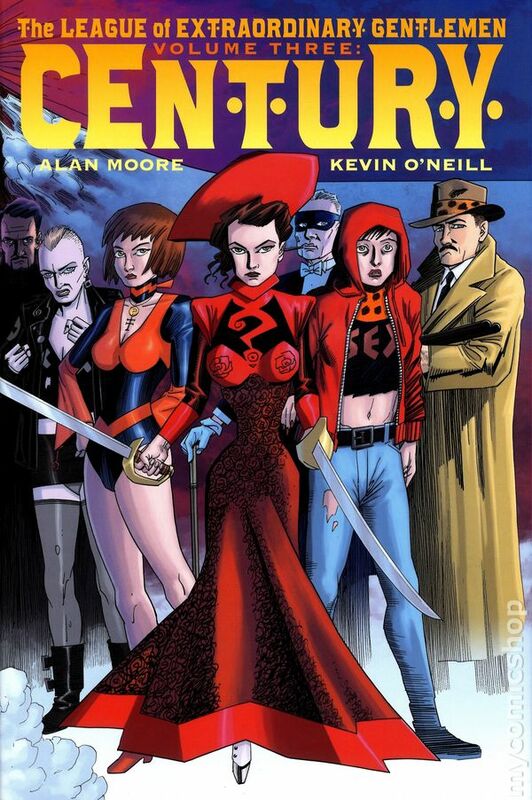 Alan Moore and Kevin O'Neill return with the further adventures of The League of Extraordinary Gentleman in this collection that reprints the best-selling second 6-issue miniseries. 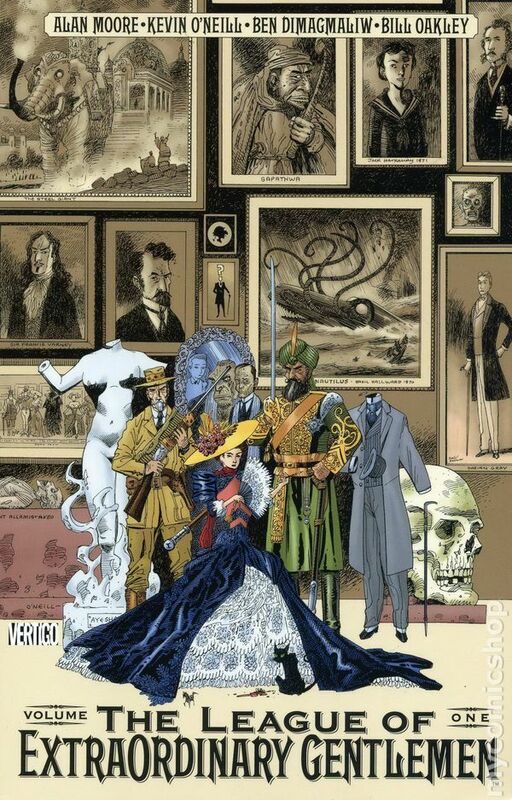 It's one month after the events in LEAGUE OF EXTRAORDINARY GENTLEMEN VOL. 1, and the skies over England are filled with flaming rockets as Mars launches the first salvo of an invasion. Only our stalwart adventurers - Allan Quatermain, Mina Harker, Captain Nemo, Hawley Griffin, and Mr. Edward Hyde - can save mother England and the very Earth itself. But there are many startling revelations along the way, including the blossoming of love and the uncovering of a traitor in their midst! Also included in this volime is an almanac of fantastic places that spans the entire globe as well as special supplemental material by Moore & O'Neill not found in the original periodicals! Softcover, 228 pages, full color. Cover price $14.95. Published Aug 2011 by America's Best Comics. Volume 2 - 2nd and later printings. 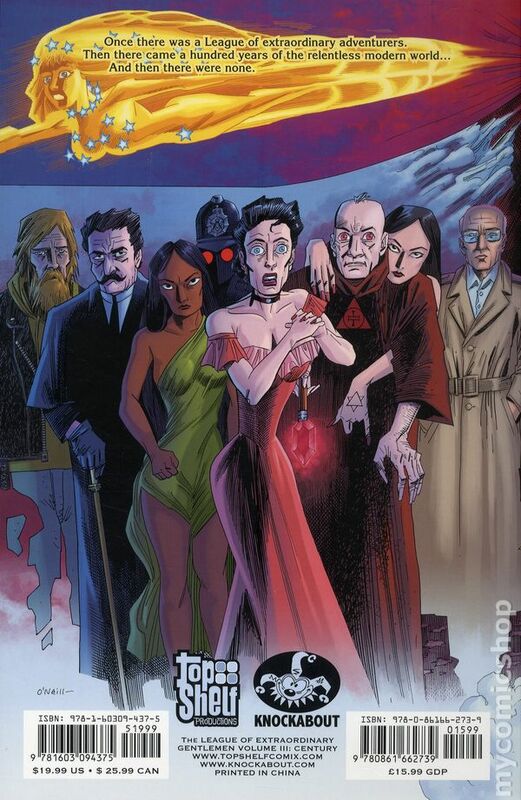 Collects League of Extraordinary Gentlemen (2002-2003 2nd Series) #1-6. Written by Alan Moore. Art and cover by Kevin O'Neill. 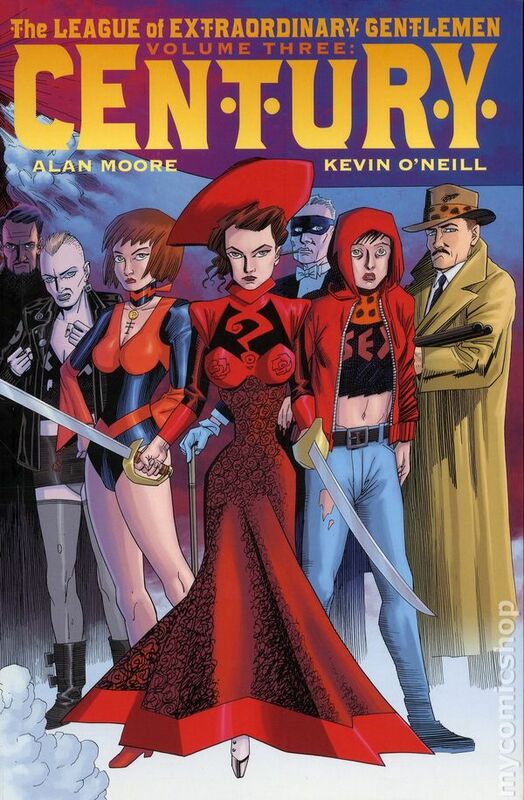 Alan Moore and Kevin O'Neill return with the further adventures of The League of Extraordinary Gentleman in this collection that reprints the best-selling second 6-issue miniseries. 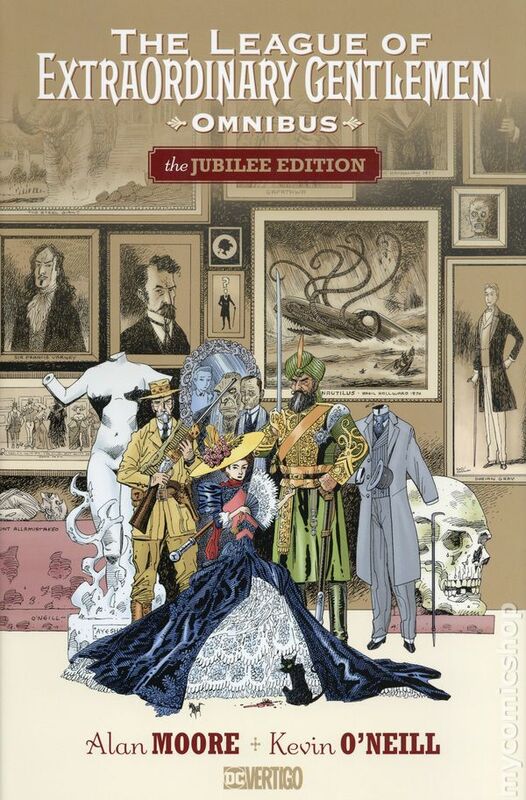 It's one month after the events in LEAGUE OF EXTRAORDINARY GENTLEMEN VOL. 1, and the skies over England are filled with flaming rockets as Mars launches the first salvo of an invasion. Only our stalwart adventurers - Allan Quatermain, Mina Harker, Captain Nemo, Hawley Griffin, and Mr. Edward Hyde - can save mother England and the very Earth itself. But there are many startling revelations along the way, including the blossoming of love and the uncovering of a traitor in their midst! Also included in this volime is an almanac of fantastic places that spans the entire globe as well as special supplemental material by Moore & O'Neill not found in the original periodicals! Softcover, 228 pages, full color. Cover price $14.95. Published May 2018 by DC/Vertigo. 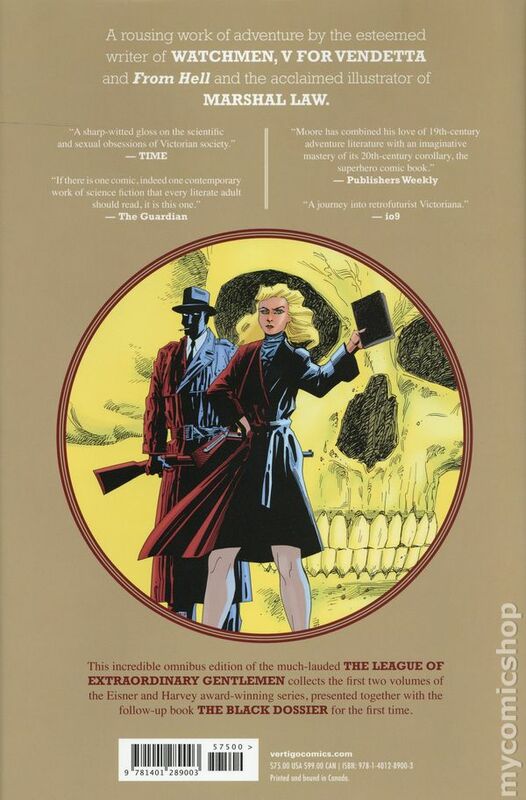 In the 1950s, England is not what it was, and with the League of Extraordinary Gentlemen disavowed, Mina Murray and Allan Quatermain seek answers that can be found only in the Black Dossier, a book buried deep in the vaults of their old headquarters. 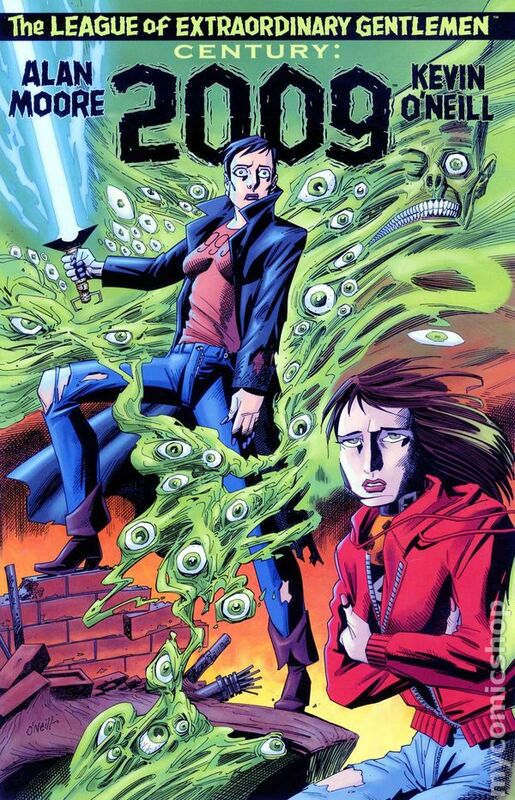 Now available in a new printing of the trade paperback, this amazing graphic novel includes a 3-D section complete with custom 3-D glasses and much more! Softcover, 208 pages, PC/PB&W/P3-D. MATURE READERS Cover price $19.99. Published Oct 2008 by America's Best Comics. Acclaimed writer Alan Moore once again joins forces with artist Kevin O'Neill for THE BLACK DOSSIER - a stunning original graphic novel that is the next chapter in the fantastic saga of THE LEAGUE OF EXTRAORDINARY GENTLEMEN! England in the mid-1950s is not the same as it was. The powers that be have instituted some changes. The League of Extraordinary Gentlemen have been disbanded and disavowed, and the country is under the control of an iron-fisted regime. 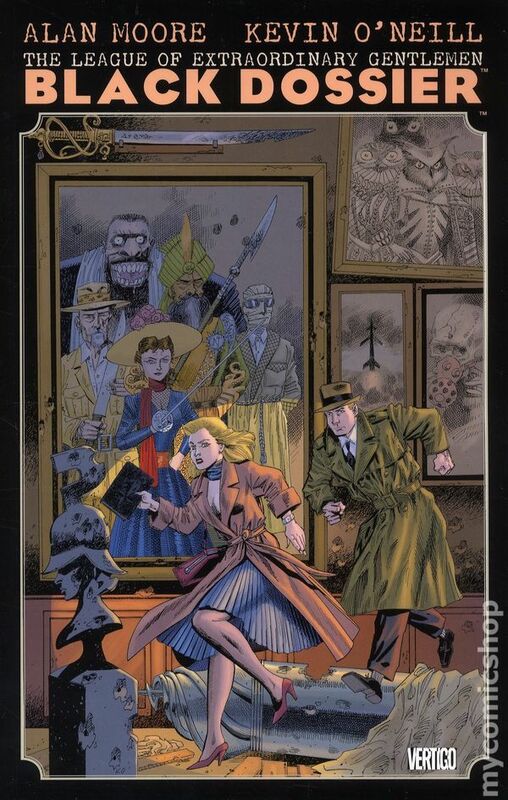 Now, after many years, the still youthful Mina Murray and a rejuvenated Allan Quatermain return in search of some answers - answers that can only be found in a book buried deep in the vaults of their old headquarters - a book that holds the key to the hidden history of the League throughout the ages: The Black Dossier. As Allan and Mina delve into the details of their precursors, some dating back centuries, they must elude their dangerous pursuers who are hellbent on retrieving the lost manuscript...and ending the League once and for all. THE BLACK DOSSIER is an elaborately designed, cutting-edge volume that includes a 'Tijuana Bible' insert and a 3-D section complete with custom glasses, as well as additional text pieces, maps, and a stunning cutaway double-page spread of Captain Nemo's Nautilus submarine by Kevin O'Neill. Don't miss what's sure to be one of the most talked-about books of 2007! NOTE: May or may NOT include 3-D glasses. Cover price $19.99. Published Nov 2007 by America's Best Comics. 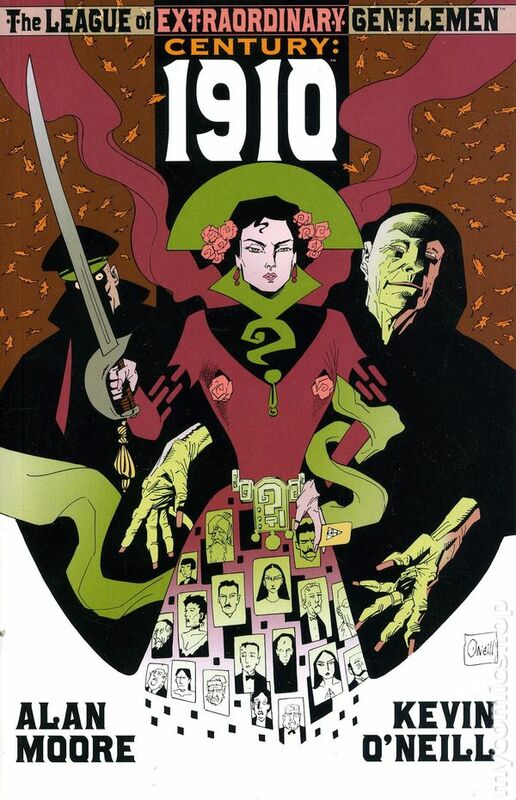 Acclaimed writer Alan Moore once again joins forces with artist Kevin O'Neill for THE BLACK DOSSIER - a stunning original hardcover graphic novel that is the next chapter in the fantastic saga of THE LEAGUE OF EXTRAORDINARY GENTLEMEN! England in the mid-1950s is not the same as it was. The powers that be have instituted some changes. The League of Extraordinary Gentlemen have been disbanded and disavowed, and the country is under the control of an iron-fisted regime. 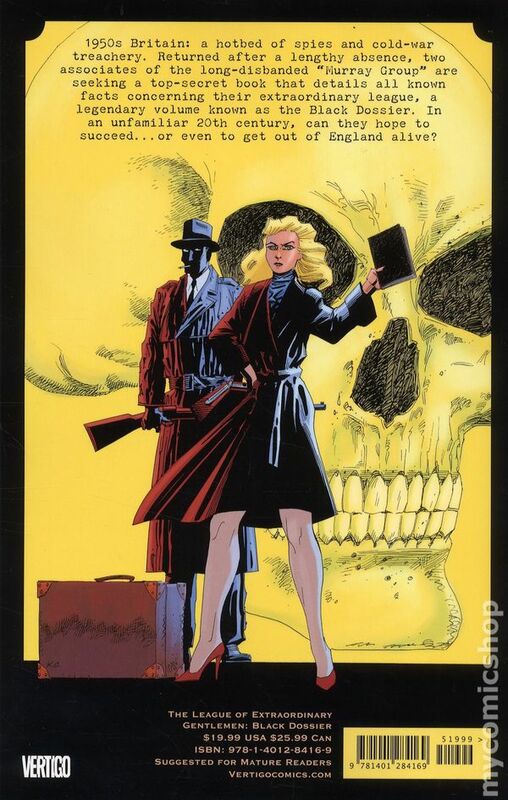 Now, after many years, the still youthful Mina Murray and a rejuvenated Allan Quatermain return in search of some answers - answers that can only be found in a book buried deep in the vaults of their old headquarters - a book that holds the key to the hidden history of the League throughout the ages: The Black Dossier. As Allan and Mina delve into the details of their precursors, some dating back centuries, they must elude their dangerous pursuers who are hellbent on retrieving the lost manuscript...and ending the League once and for all. Hardcover, 208 pages, PC/PB&W/P3-D. MATURE READERS NOTE: Available only to customers in the United States Cover price $29.99. Limited Edition Variant Cover - 1st printing. Published Jul 2014 by America's Best Comics. Volume 3 - 1st printing. "Century!" 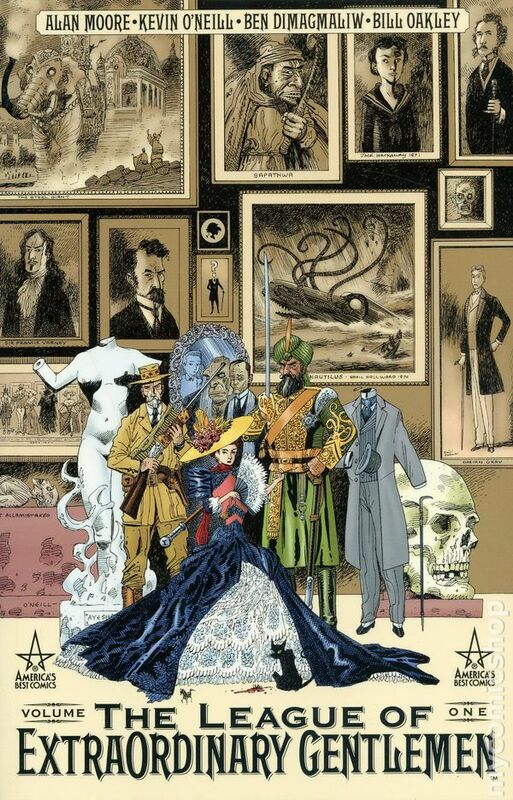 Collects League of Extraordinary Gentlemen Century GN (2009-2012 Top Shelf) Vol. 1-3. Written by Alan Moore. Art and cover by Kevin O'Neill. The nineteenth century, expiring with a flourish of Moriarty and Martians, has left the division of Military Intelligence commanded by Mina Murray in a state of disrepair. While she and her lover Allan Quatermain have achieved a measure of eternal youth, recruiting new talents such as the trans-gendered immortal Orlando, the ghost-finder Thomas Carnacki and the gentleman thief A.J. Raffles to replace their deceased or missing colleagues. Now it is the early years of a new and unfamiliar century, and forces are emerging that appear to promise ruin for the Murray group, the nation and indeed the world, even were it to take a hundred years for this apocalyptic threat to come to its disastrous fruition. From the occult parlours and crime-haunted wharfs of 1910, through the criminal, mystical and psychedelic underworlds of 1969 to the financially and culturally desolated streets of 2009, the disintegrating remnants of Miss Murray and her League must combat not only the hidden hand of their undying adversary, but also the ethical and psychological collapse accompanying this new era. And a lot of things can happen in a Century. Hardcover, 256 pages, full color. Mature Readers Cover price $29.95. Published May 2009 by Top Shelf Productions. Volume 1 - 1st printing. "1910!" Written by Alan Moore. Art and Cover by Kevin O'Neill. Alan Moore's familiar cast of Victorian literary characters enters the brave new world of the 20th century, set against a backdrop of London, 1910, twelve years after the failed Martian invasion. In the bowels of the British Museum, Carnacki the ghost-finder is plagued by visions of a shadowy occult order who are attempting to create something called a Moonchild, while on London's dockside the most notorious serial murderer of the previous century has returned to carry on his grisly trade. Working for Mycroft Holmes' British Intelligence alongside a rejuvenated Allan Quartermain, the reformed thief Anthony Raffles, and the eternal warrior Orlando, Miss Murray is drawn into a brutal opera acted out upon the waterfront by players that include the furiously angry Pirate Jenny and the charismatic butcher known as Mac the Knife. Each volume is a self-contained narrative that takes place in three distinct eras, building to an apocalyptic conclusion occurring in our own twenty-first century. The return of the League is not to be missed! Softcover, 80 pages, full color. Cover price $7.95. Published Jul 2011 by Top Shelf Productions. Volume 2 - 1st printing. "1969!" Written by Alan Moore. Art and Cover by Kevin O'Neill. 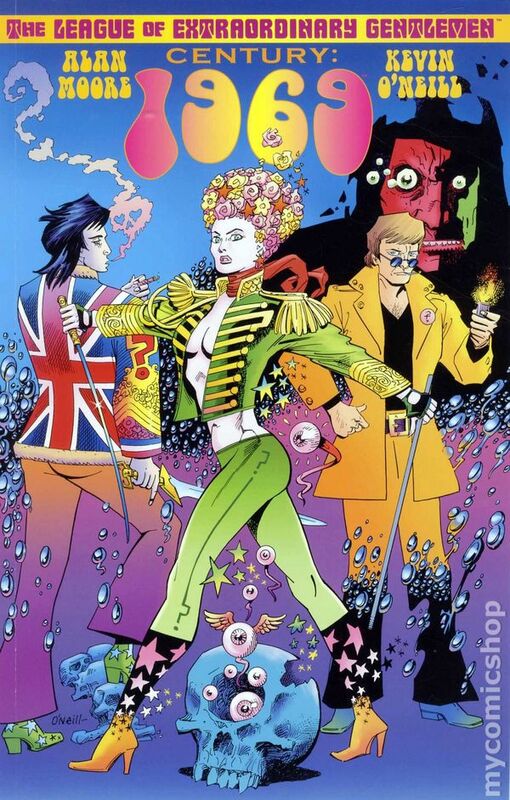 The long-awaited second chapter of Alan Moore and Kevin O'Neill's League of Extraordinary Gentlemen III: Century takes place almost sixty years later in the psychedelic daze of Swinging London during 1969, a place where Tadukic Acid Diethylamide 26 is the drug of choice, and where different underworlds are starting to overlap dangerously to an accompaniment of sit-ins and sitars. Alerted to a threat concerning the same magic order that she and her colleagues were investigating during 1910, a thoroughly modern Mina Murray and her dwindling league of comrades attempt to navigate the perilous rapids of London's hippie and criminal subculture, as well as the twilight world of its occultists. Mina and her companions must prevent the making of a Moonchild that might well turn out to be the Anti-Christ. Softcover, 80 pages, full color. Mature Readers Cover price $9.95. Published Jun 2012 by Top Shelf Productions. Volume 3 - 1st printing. "2009!" Written by Alan Moore. Art and Cover by Kevin O'Neill. The narrative reaches its cataclysmic conclusion in London 2009. The magical child whose ominous coming has been foretold for the past century has now been born and has grown up to claim his dreadful heritage. His promised age of unending terror can commence, the world can now be ended, and there is no League, extraordinary or otherwise, to stand in his way. The bitter, intractable war in Q'umar crawls bloodily to its fifth year, away in Kashmir a Sikh terrorist wages a holy war against Islam that must push the world into a nuclear holocaust, and in a London asylum there's a patient who insists she has all the answers. Softcover, 80 pages, full color. Mature Readers Cover price $9.95. Published Feb 2013 by Top Shelf Productions. 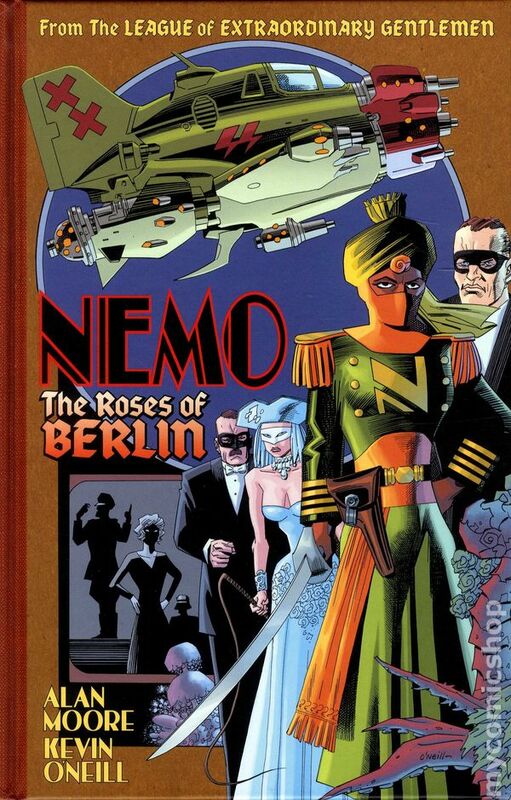 In the grim cold of February surfaces a thrilling new League of Extraordinary Gentlemen book - Nemo: Heart of Ice, a full-color 48-page adventure in the classic pulp tradition by the inestimable Alan Moore and Kevin O'Neill. It's 1925, fifteen long years since Janni Dakkar first tried to escape the legacy of her dying science-pirate father, only to accept her destiny as the new Nemo, captain of the legendary Nautilus. Now, tired of her unending spree of plunder and destruction, Janni launches a grand expedition to surpass her father's greatest failure: the exploration of Antarctica. Hot on her frozen trail are a trio of genius inventors, hired by the megalomaniacal Charles Foster Kane to retrieve the plundered valuables of an African queen. It's a deadly race to the bottom of the world - an uncharted land of wonder and horror where time is broken and the mountains bring madness! Hardcover, 56 pages, full color. Cover price $14.95. Jubilee Edition - 1st printing. 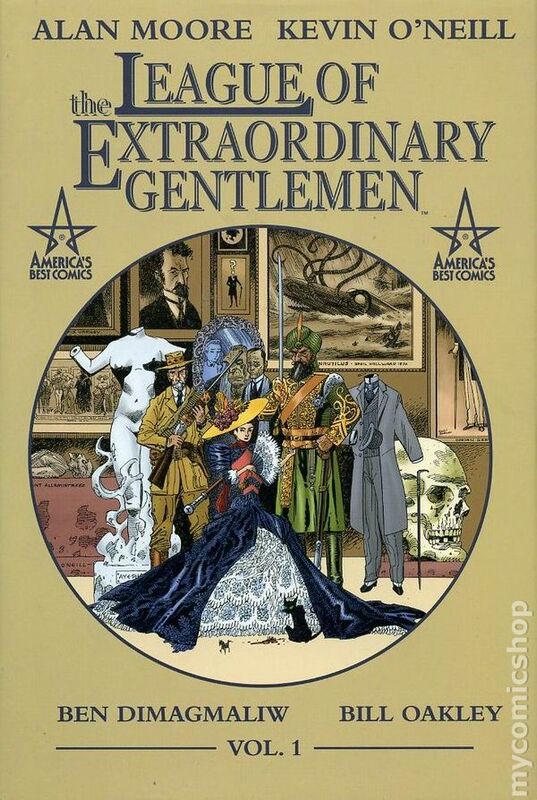 Collects League of Extraordinary Gentlemen HC (2000-2014 America's Best Comics/Top Shelf) Vol. 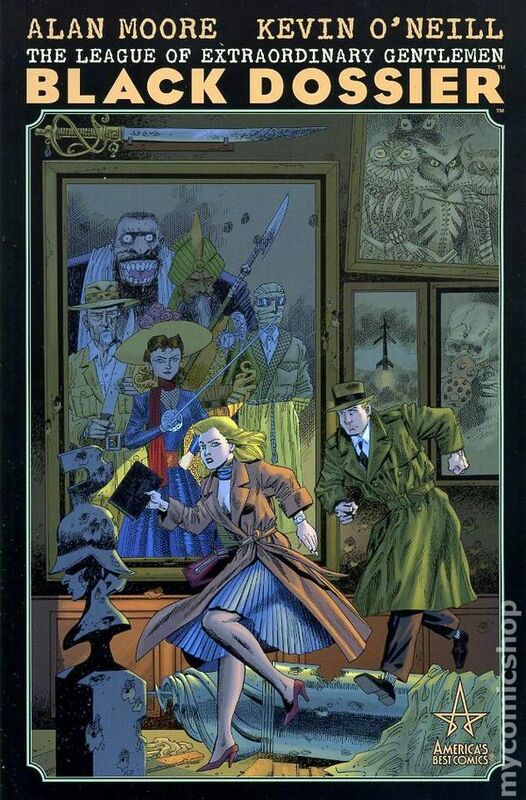 1-2 and League of Extraordinary Gentlemen Black Dossier HC (2007 America's Best Comics). 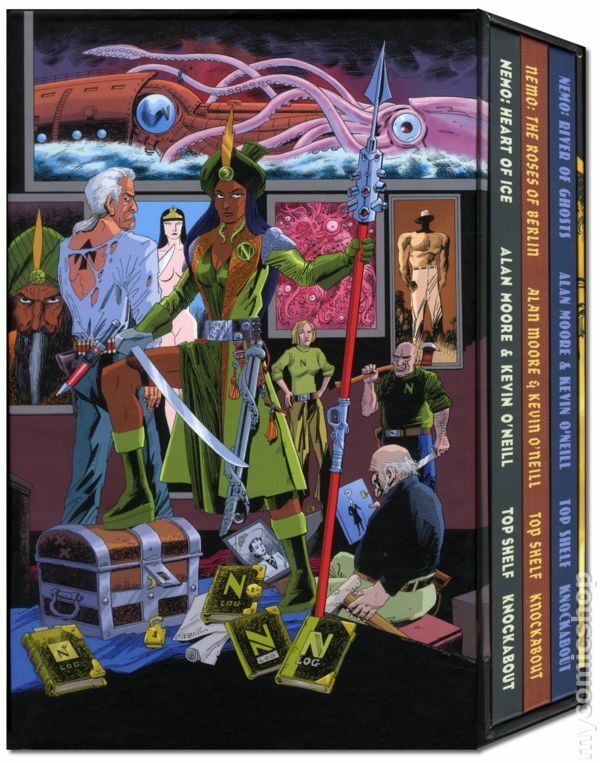 The first two LEAGUE OF EXTRAORDINARY GENTLEMEN epics are joined by Volume three, THE BLACK DOSSIER! In this incredible tale, Allan Quatermain, Mina Murray, Captain Nemo, Dr. Henry Jekyll and Edward Hyde and the Invisible Man unite to defeat a deadly menace to London and all Britons! Then, one month later, the skies over England are filled with flaming rockets as Mars launches the first salvo of an invasion. Only our stalwart adventurers can save mother England and the Earth itself. And in the 1950s, England is not what it was, and with the League of Extraordinary Gentlemen disavowed, Mina Murray and Allan Quatermain seek answers in the Black Dossier. This amazing graphic novel includes a 3-D section complete with 3-D glasses and more! Hardcover, 616 pages, full color. Published Nov 2015 by Top Shelf Productions. 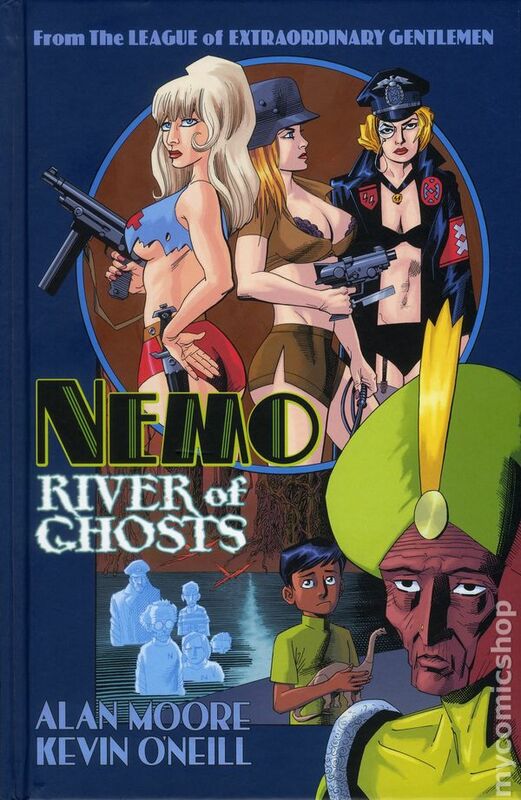 Includes Nemo: Heart of Ice HC (2013 Top Shelf) A League of Extraordinary Gentlemen Adventure, Nemo: The Roses of Berlin HC (2014 Top Shelf) A League of Extraordinary Gentlemen Adventure, and Nemo: River of Ghosts HC (2015 Top Shelf) A League of Extraordinary Gentlemen Adventure - Printings may vary. Written by Alan Moore. Art and cover by Kevin O'Neill. 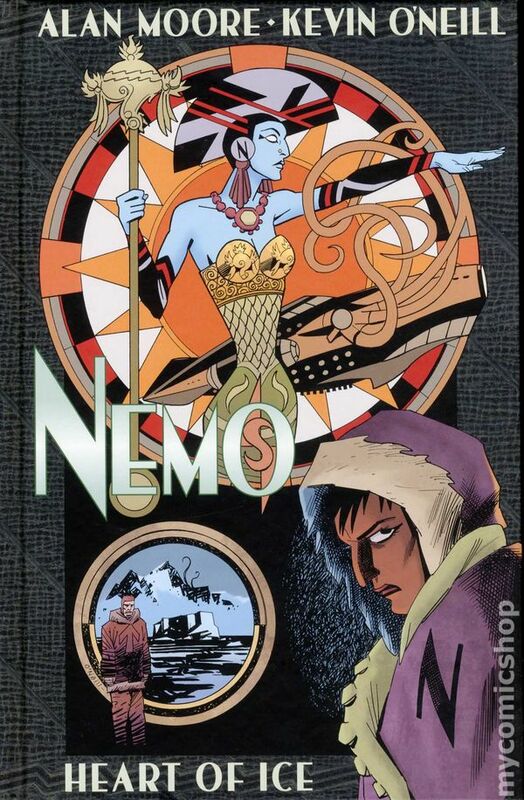 With a classic two-fisted spirit of adventure, Alan Moore & Kevin O'Neill explore stunning new horizons of their League of Extraordinary Gentlemen universe with the bestselling Nemo trilogy! These spinoff graphic novels follow the terrifying pirate queen Janni Nemo in her confrontations with unearthly Antarctic horrors (Heart of Ice), mechanical metropolitan monstrosities (The Roses of Berlin), and depraved tropical tyrants (River of Ghosts). Now, these handsome hardcovers are joined in a magnificent slipcase gloriously illustrated by Kevin O'Neill. Hardcover (3 volumes with Slipcase), 168 pages (Total), full color. Cover price $39.99.